Fertilizing won’t help at this time. The stems that you put in the soil need to develop roots. Water the soil and keep it slightly moist until more roots develop. Keep your plants in filtered light. I have a Christmas cactus that seems to have root rot. Leaves are wilted but it is flowering profusely. Should I wait to repot it after its done flowering or can I do it now. I’m afraid it’s going to die if I wait much longer. You can try to repot now, there’s a good chance that the flowers will drop off. I have a CC getting back to it’s healthy point. Anyways I had a piece brake off, so I have stuck it into a cup of water. It is rooting now but there are these brownish liquid (sticky) spots on the cup (not on the plant) What would this be and is it normal? 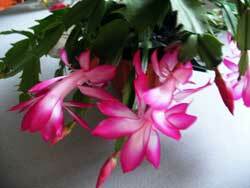 Hi, I have two schlumbergera – sol brazil and novembre brasil. when I got them they were in flower last November. They seem to have really tiny buds now. How do I tell the difference between new leaf growth and flower buds? Most likely the tiny buds are the beginning of flower buds. I have a Thanksgiving cactus that is about 25 years old. This last two months, for the first time, white powdery build up is forming at every joint. I’ve tried putting it in the sink and rinsing it but that does nothing. It has bloomed faithfully, usually two bloom sessions for many years. I have not moved it, I have not changed the once-a-week watering. Any suggestions for the white powdery stuff at the joints? Thank you! I just got a Christmas cactus and ive fertilized some of the flowers by hand. the base that’s originally green is now turning pink with a little bit of tan mixed in. Does that mean ive succeded? And from the same flowers theres a sort of pink vein going down the leaf its on. What does that mean? If the base of the flower becomes thicker and oval shaped after the flower drops, then it is fertilized. My large Christmas cactus was left in a cold, unheated room for approximately 8 weeks. When we returned home, It was weighed down with hundred of blooms and the leaves have all gone to a green/brown color. I have taken it into a heated room but wonder if there is something else I should do. The green/brown color may indicate that the plant had some cold damage or lack of water during the 8 weeks. If the foliage is not wilted/limp and a transluscent color, then there is a possibility that the roots are fine and it will send out new growth when ready. There isn’t much that you can do at this time but wait and see if the plant recovers. You should see signs of new life in a month on so. During the winter, keep the soil on the dry side but not totally dry. Be careful not to overwater. You mention often to replant sections of fallen pieces, or some pinched from plant. Do you just put the piece in dirt or do you put in glass of water for rooting? Thanks. Some of my Christmas Cacti have leaves with brown edges which eventually fall off. Is this from overwatering? Root rot? Or some other disease? It could be from overwatering which can lead to root rot. Also check the base of the stem close to the soil line. If it is soft and mushy then you may have a stem rot. If either one, make sure the plant dries between watering. If you have stem rot take cuttings and start a new plant. I have a 12 year old Easter Cactus. As strange as this may sound, it blooms 4-5 “major” times a year, but always tends to have continuous flowers at all times (there are a dozen flowers which have just dropped this week). Where the blooms once were, new growth is generated. I find that when the new leaves emerge, they begin as purplish-pink tinged. As the leaves grow larger, they change to light leaf green, then darken to a mature deep green. I don’t think it necessarily has anything to do with fertilizing. Hope this helps. Hi I have a Christmas Cactus that I purchased whilst in bloom last winter. Recently it has become limp and almost burgundy in colour but has sprouted extra segments recently. I moved it into the bathroom for the humidity and It sprouted roots from most of the segment joins. What should I do? It is no longer in the bathroom and I tend to let it dry out a little before standing in water for a couple of mins (rather than pouring it on). Someone told me to pull the root sprouts off, should I do this? Thanks! The rootlets at the joints can be left alone. They will eventually dry up. You Christmas cactus may have a watering issue. Perhaps the soil was kept too wet or too dry. My suggestion is to let it dry out between waterings but water well when you do. It’s better to pour water from the top rather than have the plant standing it in water. Christmas cactus has a shallow root system so with bottom watering the roots may not be getting any moisture. If possible place the plant in a shaded spot outside away from direct sun. I have a newly bought baby christmas cactus that I put in a planter. It looks like it was grown from cuttings. The old leaves look fine and healthy but the new growth is very pale with pink tints especially around the edges. I am fertilizing with an african violet liquid fertilizer when I water it which is about twice a week (the directions say to use daily but that is overwatering). It’s an 8-14-9 liquid. I also have regular old Miracle-gro (24-8-16) “all purpose”, but have not been using it on the CC. What am I doing wrong? Should I switch to the Miracle-gro? Also, I am not sure if it’s a Christmas cactus or one of the other varieties…it does have spiny hairs at the leaf joints and I read somewhere that that means it’s one of the others. Is that true? Let the soil dry out a bit before you water again. Don’t kill it with kindness. Constant fertilizing will not make your plant grow any faster if the roots cannot utilize the nutrients you are giving it. Feeding it every 2 weeks or even once a month with a balanced fertilizer (10-10-10) should be sufficient. The african violet fertilizer should be ok. If you overfertilized your Christmas cactus, wait a month or so before feeding it again. I have a 7 year old christmas cactus that is the same size as it was 7 years ago. It does bloom but very few blossoms. Some buds just fail to form and harden up. I have repotted it once about 5 years ago. How can I encourage this thing to grow? I would repot it in fresh potting soil. Plant in a porous soil mix by adding 1 part peat moss or sand to 3 parts potting soil mix. You can also use potting mix for succulent plants. Hello, I have a pretty embarrassing question. I have had my CC for about 6 years. It has always been in the same pot. While cleaning on a warm spring day I placed my CC outside on my deck for some sun.. And forgot about it for several days. It gets worse. It got cold and SNOWED on my poor cactus. I finally rembered and brought t in.. It is horrible. Everything is mushy and wet and a lot of the stems have turned yellow, mostly the top layer. Some are still green. Is there any hope? It has been inside and ‘drying’ for a week or so. It isnt as mushy, but still limp. Please help! Oops!! Don’t think you’re the only one that has forgotten plants outdoors. I guess the only thing you can do is wait and see. I would remove any dead parts and hope that some of the green will put on new growth. Hi. I have a very old and huge Christmas cactus. It has been pot bound to the extreme for two years now and time to get it repotted. It is living in a container that is 13″ wide and about the same tall. I want to put it in a container that is 19″ wide but only 7 ” tall. Does it have a chance in such a container? 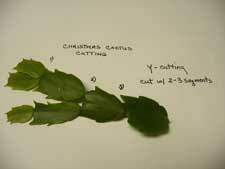 See comments under propagate Christmas cactus re: cactus fruit. Do Christmas Cactus flower on new growth or branches that have no new growth? From my experience, it blooms on current season’s growth-both new and old growth. my mom has a christmas cactus, which has great sentimental value to her. but while i was cleaning i left the cactus outside, in winter. brought it back in, in the morning and sadly it’s limp. what can i do to rescue it? If it starts to get soft and discolor(darken), then it may have been damaged by the cold. Nothing you can do. Wait and see. Be sure not to overwater the plant in the winter. Let it stay on the dry side. My leaves are getting thin and weak. Its blooming but I’m afraid its going to die. This summer they were thick and really healthy looking. What do I need to do? Are you watering the Christmas cactus? My mother used to grow Christmas Cactus that round leaves, not ones that are pointed. Is this a different species of cactus. They seem imposible to find. It may be that your mother grew Easter cactus (Rhipsalidopsis gaertneri). The leaves are rounded and usually available in the spring. Many of my cactus’ leaves are shriveling up and then fallng off. The cactus was repotted and then kept outside this summer until it got too hot. I have never had this problem before. I’m not sure if I am over watering, underwatering or what. The soil seems dry now and the bases of the plant stems are not mushy. There are a bunch of new growth shoots coming out, but a couple of leaves with shoots are now shriveling up as well. Help please!!! It sounds as if your cactus is suffering from transplant shock (still). They have a delicate, shallow root system which needs time to recover. The roots are not supplying the leaves with sufficient moisture. Hopefully, its not root (too wet soil). Keep the plant on the dry side especially in winter. Let the top 2 inches of soil dry out before watering. Hopefully, it will recover. Hi, I have unfortunately overwatered my Christmas Cactus. The leaves are wilted and limp, but still green. I am letting the soil dry out, but was wondering what to do with the wilted leaves? Should I prune them back or just leave them as is with hopes that they will plump up again? Sorry to hear about your Christmas cactus. At this time, I would leave the wilted leaves and see if they will plump up. They may also drop off. Check at the soil line for soft mushy areas on the stem which would indicate a stem rot. Hopefully, not. I have an issue with all 4 of my mature cacti. All are dramatially losing leaves. They previously flourished in the same locations for about 1.5 yrs. Now they seem to all be dying. I have tried different watering techniques (tried on the different plants separately). Nothing seems to work. They have lost over half of their foilage. Any suggestions? How do you root the fallen pieces?? I have had a Christmas cactus for several years, and while the plant looks “okay” it has never bloomed, except once at Easter. I keep it in the house to protect it. I have tried putting it in darkness for six weeks, but that hasn’t helped. How can I convince it to bloom? Try keeping it in cooler temperatures (55-59F) for 6 weeks, then Christmas cactus will bloom regardless of daylength. Bud formation will not happen if night temperatures are above75F degrees. Before repotting, I suggest a baby-steps approach. Begin with a new watering schedule. See how it responds. Then add a fertilizer and add a small amount of soil on top (if there is room in the pot for that). Once the plant is healthy, then transplant it. If you shock the plant too much, all at once, the results could be disastrous. Just moving the plant may prove to be a hardship for this unhappy plant. Good luck! I found a very old Christmas cactus at my local resale shop. The owner told me the cactus came in an estate sale and has been neglected. Perhaps no water for long perioids of time. also the soil has salt build up and altogether looks crappy. This is a fairly large plant. Should I venture to repot back into same pot with fresh soil ? The sections closest to the soil are like woody and then thin to the green sections about 2″ out begin. Ideas anyone ? I’d like to save this plant. Repotting an old Christmas cactus can be risky. They don’t take well to having their roots disturbed but it may be worth the risk. The best time to repot a Christmas cactus is after it is done blooming-in late winter-early Spring. If you repot now, you may stress the plant and risk flowering. If the plant is in bad shape, then repot it in fresh soil. Otherwise see how it responds to the new environment and repot in late winter. My christmas cactus ( 50 years old plant just replanted a couple months ago) loses severals 2- 3 inch pieces – everyday I find new pieces the floor. Older christmas cactus does not take well to having their roots disturbed. Hopefully, it will recover. Take the dropped pieces and root them for new plants. I have a Christmas cactus in great health. I’ve had it about ten years and it came from a small cutting reputed to be in existence in one family since 1860. Do you think these plants can live 150 years? Yes, I have read that Christmas cactus plants have lived for 80 years and that’s the original plant. So any cuttings can continue the legacy for many years. I’m not familiar with white scale. Could it be mealy bug? My Christmas Cactus’ shoots are brown near the soil but green on the ends and a bit limp. What do I need to do? If the shoots are soft then the plant has a stem rot. I have several Christmas cactus, and they recent have all developed the same symptoms – the buds form, but dry up and die before they are fully formed buds. The plants look healthy enough – and they DO bloom. But there may be 2 or 3 blooms, and the rest of the buds die. I’ve got one that’s 20 years old and would hate to lose it! Help please!! What time of year does this happen? Just found your website and enjoyed reading all the questions and answers. I’m wondering what type of container is best for growing my Thanksgiving/Christmas cactus. I have some pieces in a plastic pot and the leaves appear dark green and shiny. The other sections are in a clay pot and are paler and not shiny, but have produced some flowers this past season. I don’t water until the soil appears dry and have used a potting soil for cactus. I never fertilized them, but will do so this summer. I live in Louisiana and I’m not sure if it would help to put them outside during the summer. Thanks for your help. You can put your Christmas cactus outside in the shade for starters.